We also deal in Global isi aluminium fittings . We are providing in Anti Rettling Guide. Well known as Aluminium Window Fittings, Aluminium Accessories. Aluminum Window Fittings An exclusive and appealing range of aluminum window fittings is offered by us which have carved a niche in Indian and overseas market. Modest of design with charismatic charm are the words that are synonymous with the qualitative collection of fittings such as SAA Louver Vents, Sash Lift, Casement Stay, Sash Handle and more. We provide a wide range of window fittings, which is providing enough choice to the clients to choose from. Available at reasonable prices, these window fittings can be customized according to the clients' requirements. We are Leading Manufacturers of Window Corner Cleats based in Ahmedabad. 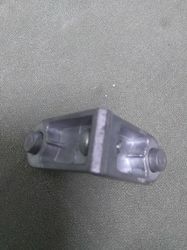 Our Window Corner Cleats are manufactured using standand quality raw materials. We provide timely delivery of ordered goods. We are manufacturers of Packing Shims for Aluminium Windows, in any size as per your design or sample. LGF Sysmac (India) Pvt. Ltd.
Customers mostly preferred to purchase quality products, so we are involved in offering unmatchable quality of Aluminum Window Fittings. The offered Aluminum Window Fittings are extensively used with any kind of sliding doors. Further, our products are recommended amongst our customers due to their premium quality.